From fine dining restaurants to residential dining, USC Hospitality serves over 65,000 students, athletes, faculty, and staff, as well as our many visitors. 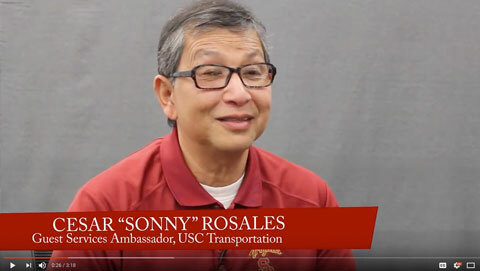 Hospitality is one of the six core business units that comprise USC Auxiliary Services and one of the largest employers on campus. We are renowned for our fresh take on self-operated food concepts with 43 restaurants between both campuses. The team at USC Hospitality is led by innovative executive chefs and directors who strive every day to craft nourishing and wholesome alternatives for our hungry Trojan Family and our guests. We are seeking a Floater Guest Services Representative/Cashier to join our rapidly growing team. This position will work in multiple locations and will not have a set schedule. Customer service is our number one priority, and the Floater Guest Services Representative/Cashier will be responsible for upholding our high standards of excellence as you welcome our guests. You will help to ensure that our energetic, friendly, hardworking, and warm work environment flows throughout the kitchen and dining room. As a Guest Services Representative, you have the opportunity to provide an exceptional experience for every guest that walks in our door and leave them with a lasting impression. Provide customer services to faculty, staff, students, and guests. Meet and greet guests. Provide necessary information to guests. Maintain the cleanliness of the facilities, equipment, and servicewear. Assist in set-up and break-down of dining room, serving area, buffets, coffee stations, and product displays. Stock and maintain all supplies, food items, and utensils. Provide basic hot and cold food and beverage preparation service. Serve food and beverages to customers. Assemble and package food and beverage products. Interpret and execute directions and requests on Banquet Event Order forms. Provide basic audio-visual service and support. Open and close facilities as required. Assist in kitchen sanitation program. Comply with standard food handling and sanitation procedures. Adhere to department service standards and to all health, safety and university rules and regulations. Attend and participate in meetings as required. Report to station, ready to work at the time work assignment is scheduled to begin. Education: High School degree not required. Experience: 0 – 6 months. Cash handling experience in a fast-paced environment. Experience working as a busser or food runner at a high-volume, fast-paced restaurant or hotel. Proven ability to provide the highest level of customer service and work with various levels and types of customers. Knowledge of proper serving protocols. Knowledge of food handling and sanitation procedures. Demonstrated customer service experience. Experience working in a fast paced working environment. Ability to effectively communicate in English. Ability to lift up to 50 lbs. Demonstrated cash handling skills. Knowledge of food handling and sanitation procedures.